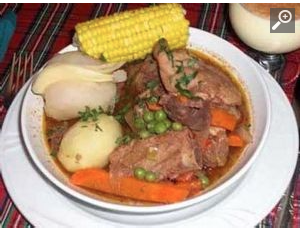 From Pagina Siete, a very traditional Bolivian meal that is only eaten at this time of the year, if you haven’t… here is how to make it, enjoy! In the pressure cooker with one and a half liters of boiling water, cook the chest for one hour, once the meat is soft, let it cool to remove fat from meat. Add the pieces of lamb and chicken (previously washed) add the mint with the grilled green pepper; carrot, turnip, squash and cut into julienne onions, season with pepper, leafs of laurel, parsley, whole celery, the red pepper and salt to taste. When the meat is half cooked add the whole potatoes and finish your cooking. In another pan with enough hot water, cook the corn with the previously wrapped in a little cloth, tightly closed anise and add the sugar. Once cooked potatoes and meat, pour the wine, beer and leave to a boil. In a bowl, serve meat garnished with vegetables, two potatoes, broth and corn served separately on a platter. For a different flavor, first seal meat in hot oil and cook, following the same procedure above cooking, do not add pumpkin and add more at the end, a teaspoon of raisins previously soaked in water. Worth trying, my family and wife’s family prepare it a little different, no pumpkin… but anyway it is prepared, is a real treat for this holiday season! This entry was posted in Bolivia, Holidays, Tourism and tagged bolivian christmas food, picana. Bookmark the permalink.